Loading Dock Supply offers several standard yard ramp models in addition to our full line of add-ons custom fitted for specific applications. For most instances the 36' foot yard ramp with 6' level off is ideal. When determining which type of ramp you need we suggest giving our sales staff a call at 1800-741-1258 or review our selection guide. We strive to help you determine what variables should be considered before quoting/purchasing; this way we ensure you are receiving the most accurate information for your bid. 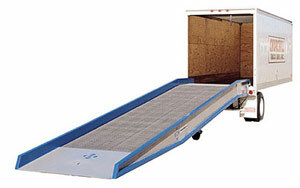 Standard model yard ramps from Loading Dock Supply feature a continuous steel superstructure ending in a 15" lip. This design is intended to rest on the rear of the trailer or loading dock with the hydraulic undercarriage pressure released or the adjustable legs raised. This allows the yard ramp to effectively float up and down with the trailer. This simple design ensures not only the longevity of the ramps integrity, but also that you are loading at the optimal position throughout the loading/unloading process. Remove the handle from the cradle and insert it into the self-contained, double-acting hydraulic pump receptacle. Pump the lever back and forth until the ramp lip is raised above the dock or bed height. Move ramp forward till stop plate touches truck. release the pressure so at least 10" of the lip rests on the truck or dock. 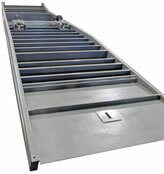 Heavy duty steel girders provide the majority of the ramps load bearing capability. When welded to the Steel Z side members these provide a superior support system for a variety of capacities ranging from 16,000 lbs-100,000 lbs depending on the model. 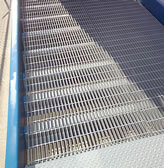 For added traction and functionality the yard ramp incline decking is constructed of all steel grating with serrated teeth on the working plane. This allows for optimal use in conditions where rain, snow, and ice would become a problem on solid diamond deck surfaces. Moving a yard ramp has never been easier. For short distances the ramp clamp offers a light weight easy to store method of positioning your yard ramp. While our other option, the tow bar, allows the ramp to be moved greater distance across facilities with the ease of towing a trailer. Both ends of the ramp feature a diamond deck plate with a beveled edge for a smooth transition on and off the ramp. For optimal functionality and integrity the ramp must use the diamond decking on both ends of the ramp. 8" high steel curbs provide both weight capacity and a noticeable barrier high enough to keep most equipment from accidentally running off the ramp. For immediate assistance please give us a call at 1800-741-1258. Our Highly trained staff is available to answer your questions.